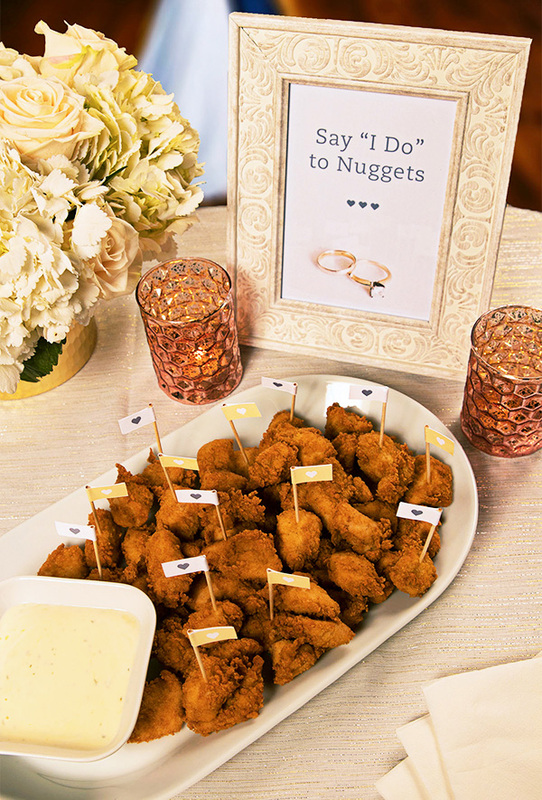 In addition to offering Chick-fil-A nuggets to-go, here are a few other ways to have a Pinterest-worthy, personalized reception. Use your invitation to gather some information: On your RSVP card, ask your guests what song they would like to hear at your reception. Now you have a built-in playlist to give to the DJ or band. Having a casual affair? Add some word games to your RSVP cards. Guests can let you know they’re coming to your celebration- and make a few cracks at the same time. The responses are sure to make the bride and groom smile and can be a fun treasure to revisit on anniversaries. Need inspiration? Check out this Etsy store for ideas on how to make this lighthearted touch work for you. Give your guest book an extra something with an instant camera. Simply leave a camera on the table with some pretty pens and an empty album. Put up a sign asking guests to take a selfie, place it in the book, and sign underneath. Plenty of personality will pop off the page and make your guestbook stand out. Find detailed instructions here. Spotted too many photo booths at weddings? Delight your guests with a caricature artist. Bring the artist in for an hour or two at the reception to draw out a giggle from even the shyest aunt. The artist will capture friends and family in the moment and send them home with more than just a memory. Find a way to include close family members in the reception. One example is to use cherished recipes at the dessert table. Featuring Nanny’s chocolate cake, Aunt Mary’s Italian crème cheese cake and Mom’s red velvet (with corresponding name tags in front of the dishes) will honor those special relatives and make all your guests feel like they’re part of the family. Take table numbers up a notch by using photographs of you or your future spouse at the corresponding age. Table two should feature a picture of you at two years old, table four at four years old, etc. Be sure to put the actual number under the photo where guests can see it so no one gets lost. Another option: put out small notebooks with the table number in large print on the front. Around the number, write something like “Please leave a message for the happy couple to read on their ____ wedding anniversary.” Reading through those books on the corresponding anniversaries will be a great way to reminisce -- and maybe even get some sage advice. If you are having little ones at your wedding, give them their own entertainment with coloring books. Your flower girl and ring bearer will be busy doing wedding word searches and drawing their artistic renderings of what’s happening around them. Click here for a free (adorable) kids wedding activity book printable. Select wedding favors that fit your personality. If you and the groom love coffee, choose your favorite brew and have the beans pre-packaged for guests to take at the end of the night. Have several guests coming from out of town? Send them on their way with something that shows your state or hometown pride. For example, guests visiting Chick-fil-A’s home state may get a jar of some Georgia-grown Chocolate Covered Pecans. Check out Martha Stewart’s page here for other regional ideas.